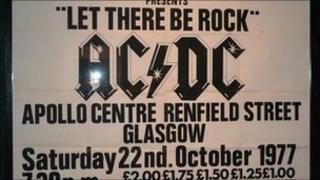 In 1977 Australian rockers AC/DC came to Glasgow chanting the mantra Let There Be Rock. They played to a sell-out crowd at the city's infamous Apollo venue as part of a huge European tour. Head-banging fans and screaming groupies paid just £2 to see their idols. Now, more than three decades on, those same fans can shake off their leather trousers, don their devil horns and do it all again...well almost. In the most unlikely of venues the story of AC/DC is being played out. The corridors of Kelvingrove Museum, which usually echo with the sounds of young children playing dress-up or tourists enjoying the art, will, from this weekend, ring out with guitar-smashing, stage-diving rock anthems. A new exhibition, AC/DC Scotland's Family Jewels, is being held in the museum's basement and is likely to attract a "different" crowd. "When we sent the exhibition to Darwin we asked them for some feedback about the kind of audience it was attracting and they sent back a very funny email," says curator Tim Fisher. "They said orders for Steak and Chips had gone up in the museum's cafe and everyone was asking if they could take their beers into the theatre." It's the first time this, band-approved, exhibition has left Australia and Scotland seemed like the obvious place to bring it. "There's so many connections with Glasgow and Scotland and when I was putting the exhibition together in Australia I kept finding material about it, " says Mr Fisher. "One of my bits of research was to go see AC/DC at Hampden Park a couple of years ago, and when I was here I came to see the people at Kelvingrove and that's how it all came about." Founding band members Angus and Malcolm Young were born in Glasgow before the family moved to Australia in 1963. Their immigration papers feature in the first section of the exhibition which charts their childhood and life before AC/DC. An early photograph shows the brothers posing at the Christmas display at a department store in Glasgow. The other Scottish connection, of course, lies in former frontman Bon Scott, who was from Kirriemuir. He died in 1980 and a whole room at the exhibition is dedicated to his legacy, with much of the material coming from his mother Isa Scott who only passed away earlier this month. "This is Bon Scott's own Highway to Hell tour T-shirt, " says Mr Fisher. "When I was first given it we opened it up and it really still had that smell of rock and roll. "If we wanted to clone Bon Scott I think we could do it from this shirt." A leather jacket worn by Scott, handwritten lyrics to Highway to Hell, a prototype version of Angus Young's signature schoolboy outfit, one of his custom-made guitars, and over two hours of songs and interviews feature among the 450 items that make up this exhibition. There's even an interactive section where fans can swap their air-guitars for the real thing and have a go playing Highway to Hell and You Shook Me All Night Long. And a closer look gives a unique insight into the rock and roll lifestyle. A postcard sent by Bon Scott to his mother while on tour in Germany in 1976 says "Irene (his wife) has had to stay in England. She's got me wearing my chastity belt!" The exhibition also features Geordie frontman Brian Johnson who joined the band in 1980, following Scott's death. But is Kelvingrove really the place for such things? There are those who say a rock band's story doesn't belong in a gallery or museum but Mr Fisher thinks differently. "We know there is a huge audience for this kind of exhibition. "Over 60% of those who came to the show during the Australian tour hadn't been to the museum for the last five years and that's like the Holy Grail for museums. "They want to try and attract new audiences." So the leather-clad rockers may well be rubbing shoulders with the art lovers, tourists and toddlers during the next few months. And if there's one thing the curator hopes visitors will take away with them it is, of course, the music. "What I am hoping for this show is that people are interested in all the material I have collected together, and the kind of cultural bit of it, but the main thing is the music," he says. "They have got to have a great rock and roll experience." AC/DC Scotland's Family Jewels opens on Saturday 17 September and runs until February 2012.